Last year she was the Women's Professional Rodeo Association (WPRA) Rookie Breakaway Champion. 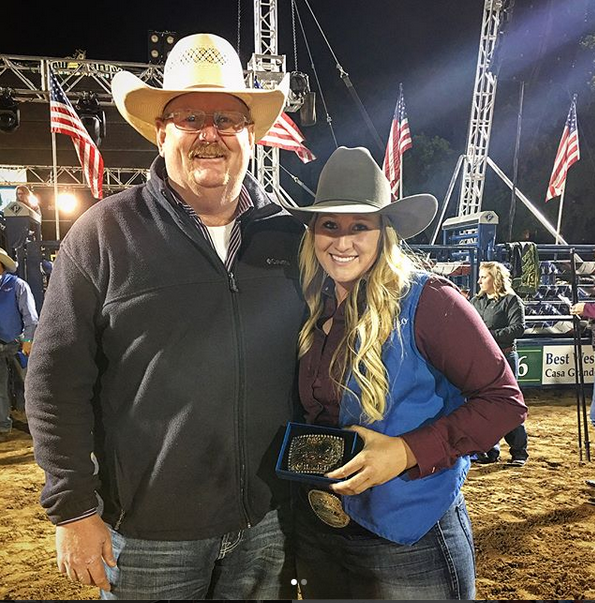 In 2017, she also won several college rodeo titles including Cal Poly Royal and qualified for the Junior National Finals Rodeo in the breakaway roping. And now, Abigayle Hampton just won the first ever 2018 Cinch Shootout at Cal Poly Royal and she’s heading into the last rodeo of the season with the West Hills College Rodeo Team with a 250-point lead for the breakaway title. Hardworking and beautiful inside and out, Hampton set her goals high as she her plans this year include making it to the college finals, hold a high placing in the points for the WPRA and soon, being a world champion breakaway roper. Currently, the sophomore is a full-time student at West Hills College along with working part-time job as a secretary for Triple J Ready Mix. At the end of the semester, the blonde beauty will graduate with an Associates in Arts (AA) Degree in Liberal Arts: Math and Science and Liberal Art: Social and Behavioral Studies. After obtaining her AA, Hampton will continue to rodeo for her third year while attending the fall at West Hills College. When she is not studying or making money, she is horseback – riding colts or practicing. 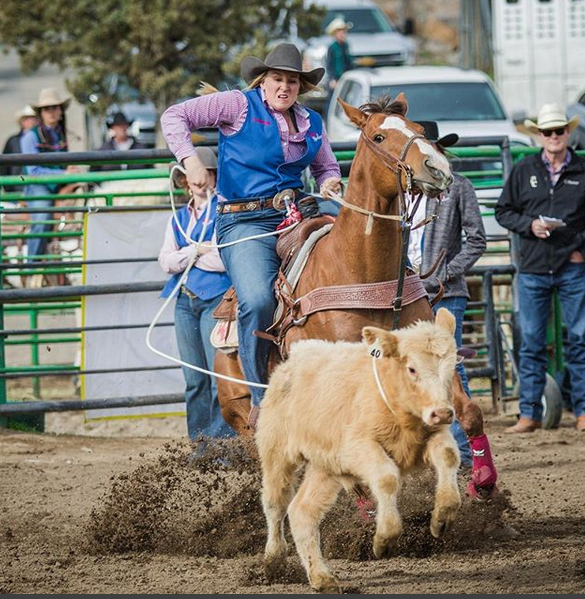 After college, she is considering sports psychology or coaching, hosting clinics or even educating, as she loves teaching people the fundamentals of breakaway roping. With the eyes always on the prize, when Hampton backs in the box, you best believe, she’s ready to win! Tell us about your experience in college rodeo? College rodeo has been a wild ride. I had a chance to make the college finals my freshman year and fell short by a few points. I ended up winning the Women’s Rookie of the Year, but not making the college finals really put a fire in me. Coming into my sophomore year I told myself I would not be in a position like that again. I came back stronger and ended up leading the Breakaway and the All Around, while also sitting second in the goats. I had a really good lead coming into the second half of the rodeos. I had a few ups and downs, but now here we are about to head into the last rodeo, and I have almost a 250-point lead in the breakaway, I have a good chance to make it in the goats, and our Women’s team has a really good shot of making the college finals. I came back strong, like I wanted and I couldn’t be more proud of myself for setting a goal and sticking to it. What was it like winning the first ever Cinch Shootout at the Poly Royal this year? Wow, what an experience. It’s actually kind of a funny story. When Cal Poly posted a sneak peak of the buckle on Facebook, it was the Breakaway buckle. I sent a picture of it to my dad and I told him I’d bring it home in a week. It turned out to be true. I was last out and I made a great run under some fast runs. Sometimes I can take pressure and thrive off of it. But sometimes, I fall short; thankfully that didn’t happen this time. Cal Poly did a great job putting on this rodeo and it was a fantastic opportunity for us young adults to rodeo against the best in the region. I am really excited for the next few years to come because Ben Londo has a lot of big plans for that rodeo performance. It’s going to be a great experience for people outside of our region. It is one of the biggest college rodeos in the nation and it continues to get bigger. Hats off to Ben and the Cal Poly Rodeo Team. Why is Breakaway Roping your favorite event? I did not start breakaway roping until I was twelve and when I started I never stopped. I now have multiple wins in the breakaway and I train colts in this event as well. I love this event because it is the fastest event in rodeo. It portrays a horse’s true ability as an athlete: run as fast as they can and stop as hard as they can between a 2-4 second time. It’s amazing what a horse has the capability of doing in this event. It gives me a rush. My muscle memory takes over when I nod my head and I can’t stop it if I tried. What do you feel is the most challenging aspect of breakaway roping? The most challenging aspect is not allowing yourself to play into everyone else’s success and focusing on your own. Before I learned how to be a better me, I was always worried about what everyone else was doing in their run. Once I realized how to beat myself instead of trying to beat everyone else, I truly became successful. I was constantly trying to be faster than everyone else that I lost myself in the game. I figured out that I need to focus on beating myself rather than beating everyone else. I am my biggest competition. Once I figured that out it was game on. How do you mentally prepare before competing? One of the things I make sure to do is picture MY perfect run. I picture exactly what I plan to do on that calf. Once I have a game plan, I put it to use on the dummy and get the feel right. I feel like when I do these two things I am truly mentally prepared. Right before my run I say a pray and tell myself that no matter what God receives the glory. I go make my run and whatever happens, happens. I cannot change yesterday, but I can determine what happens tomorrow. Who is your rodeo idol and why? Lari Dee Guy is an animal in the roping pen. Heading, heeling, breakaway roping, even the tie down roping, you name it she does it. But what’s even cooler is that we’ve become pretty good friends this last year. It’s pretty cool when you become friends with your lifetime idol because you start to look at them a lot differently. You aren’t necessarily intimidated by them anymore, but instead you know you can call them up at any time and say, “Hey what did I do in this run?” or “How does this horse look?” I know she’s not going to give me just any opinion, but the opinion of a mentor and a friend. That is a huge blessing let me tell ya. Favorite place to be entered and why? One of my favorite places to be entered is Poly Royal in the stadium, or the Three Star Memorial in Texas. Poly Royal is one of my favorites because it is one of the biggest crowds in the nation. The energy of it all just gets you pumped. The Three Star Memorial is one of my favorites because of the set up. It is an even score so you really have to see them out there, but what’s even better is that the calves are dead fresh. There is about 175 girls entered every girl gets a fresh calf in the first round. It’s pretty fun. This is one of my favorite stories to tell. Snooki came to me about four years ago from a guy named Danny Leslie. Danny had a five-year-old mare for sale that he had taken to some jackpots in the heeling and had a few calves roped on her. I honestly did not want to try the mare at all. Danny wanted $2,000 for her and I was beside myself when my dad said I was trying her because I figured she’d be a dink. She tried to hump up the first time I got on her and almost got me down. She couldn’t get into the ride lead, she was scared of everything, but the one thing she was good at was running and stopping, hard. I quickly fell in love with her after roping calves on her. She was a blessing in disguise. I took her to a rodeo three months after I got her and the rest is history. I have won a lot of money on her and have won many prestigious awards on her. This same story has gone down with my young breakaway horse, Paly. Paly came to me last July - My dad bought him sight unseen for a very cheap price as well. He was super green and yet again I could not believe my dad bought a complete dink. I could not believe he actually thought this horse could make something. The only good thing about this horse was his papers, but by the looks of it they weren’t doing him much good. But, for the second time, dad was right and I was wrong. Paly could not lope a circle when I got him in July and in October I ran my first calf out of the box on him a month later, I took him to his first jackpot. He got to make a Texas trip with me in February and he has already won be over what I paid for him. He just came four and he handles everything like a veteran. I was scared I was pushing him too quick but he loves it and continues to get better every day. 1. I was planning on playing softball in college at a young age until rodeo sparked up at the age of 12. 2. I have a sister who has no part in rodeo, she is actually a swimmer and her name is Elizabeth. 3. Somewhere deep in the many years of Roper’s Sports News, I was the face of Roper’s Sports News. The picture is of me at about 2 years old reading the Roper’s Sports News buck naked on my little training potty. 4. I have donated my hair to Locks of Love twice. 5. I had a 22 year old pony named Cocoa Puff Daddy that would roll over on top of me every time I rode him (not the greatest experience). Advice you would give young girls in rodeo or going into college rodeo? Live it up. Do not go into college rodeo thinking you’re going to get beat. You can compete with these girls. Don’t ever think any less of yourself no matter what anyone says. Your biggest competition is yourself. Rope aggressive and never stop thriving! You can rope just as good if not better than any other man out there, do you girl! And never, ever, ever stop trusting in God’s plan. I could not be where I am today without my family. My grandparents have played a huge role (Roger and Karen Campbell, Farrell and Orval Watkins, Bill and Valerie Hampton, and Earl and Beverly Hall). My parents, Jennifer and Justin Hampton and my sister Elizabeth. My aunts and uncles (Todd and Stacy Hampton and Josh and Kasey Campbell). Every one of these people have impacted me or helped me out some way and I can’t thank them enough.